Dark predictions of rain – even thunderstorms – kept us glancing upwards as Sunday March 18th dawned. But again the sky was eggshell blue without a hint of cloud. The day’s walk would take us along the southern banks of Lake Burley Griffin – the biggish sausage-like lake in the heart of the city – through small stands of eucalyptus and pine trees, into the southern dormitory suburbs of the city and ultimately past Australia’s federal parliament rising above foothills of shiny government buildings. About 100 walkers took part in the twenty kilometre walk. Here are some of them checking in at the control centre. The walk produced the usual cast of stand-out eccentrics: a Dutch gentleman walking in sandals and a blue cotton kaftan with a Pashtun cap on his head and smoking roll-your-own cigarettes; a small group of Japanese women all wearing white cotton gloves; an energetic group of Dutch-Australians talking exuberantly in Dutch and sporting patriotic bright orange tee-shirts stamped with the cryptic message “Peaky Striders”. 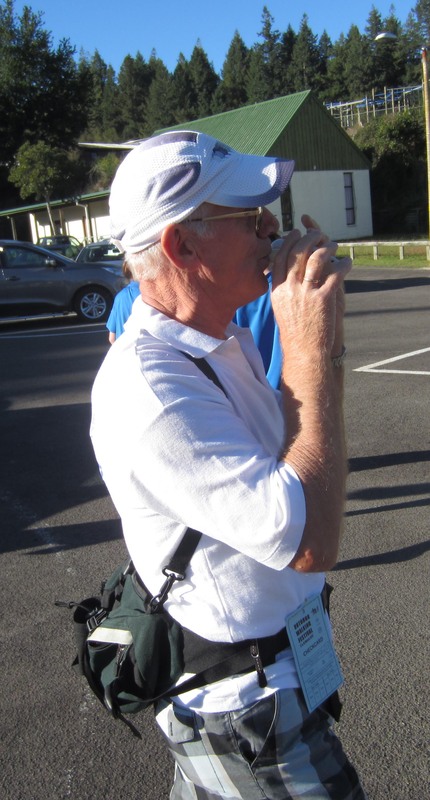 But unlike in Rotorua, this time no-one was playing the ocarina. 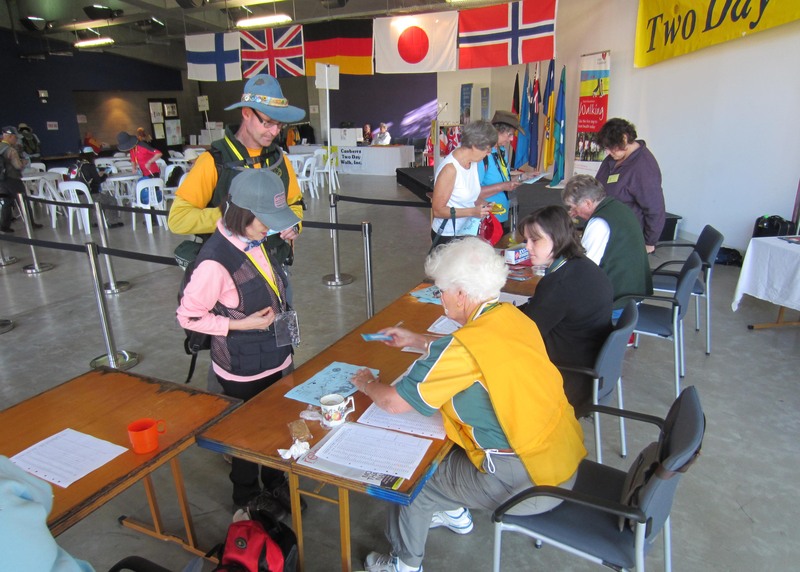 Walkers have their registration cards punched at a check point staffed by local volunteers. 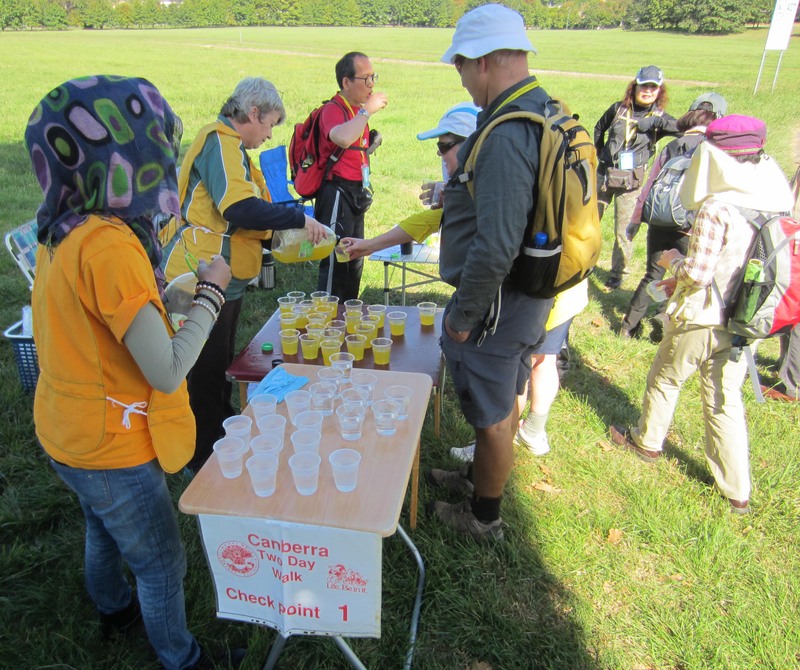 There is water and orange cordial to help walkers fight off dehydration on a warm Canberra day. 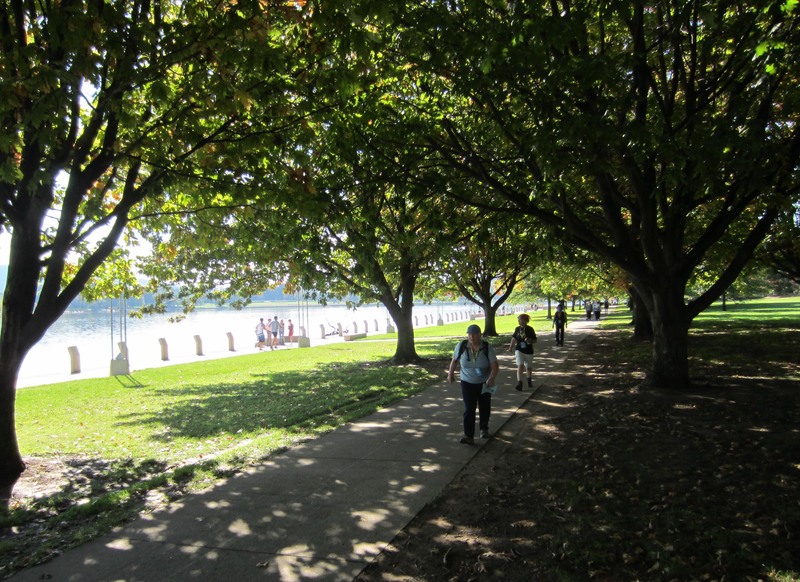 The first stage of the walk took us along a picturesque lakeside promenade and past lakeside parks where, later in the day, the aroma of roasting meat would drift up from barbecues and children would criss-cross the grass in pursuit of soccer balls. Already people were sitting on park benches, stretching their bare white legs in the sun and wriggling their toes. Across the lake a hot-air balloon slowly puffed itself up ready to lift into the lazy air. Canberra's still autumn days are ideal for hot air balloons. Here one is about to rise from a spot on the edge of Lake Burley Griffin. Behind it lies the newly planted patchwork of the National Arboretum. We skirt the south banks of Lake Burley Griffin. The low-rise centre of Canberra is mirrored in the water. At midday we stopped in the courtyard of a small suburban shopping centre (see Google Earth: 35°19’31.22″S, 149° 4’57.09″E) and, sitting under a big tree, ate a bread roll from our back packs. Shoppers strolled in and out of a barely busy supermarket. The proprietor of a secondhand bookshop taped a hand-written message to his shop window then stood looking at it for long minutes, his chin cupped in his hand. A cyclist squatted repairing a puncture in his small son’s bicycle. Patiently he performed each stage of the repair, then leaned back on his haunches as his son repeated the operation. Two elderly ladies shared a walking frame, stopping every few steps to draw breath, rummage through their purchases and compare their shopping dockets. Everything seemed to be in slow motion and getting slower. Sunday afternoon lethargy was nodding over the city. Walking in the morning shade of lakeside trees. Around one o’clock, as we walked among the prosperous houses of Canberra’s inner south, clouds suddenly swarmed across the sky from the west. Drops of rain began to flick our faces and a small, cool breeze sprang up. Emmy and I had reached Parliament House, and at the northeast corner of its perimeter road (see Google Earth: 35°18’27.60″S 149° 7’38.37″E) we leaned against a granite wall and quickly put on our rain jackets. But it was a Sunday afternoon shower… it really couldn’t be bothered. After a few minutes it ambled off and left us sweating inside our water-proof jackets. 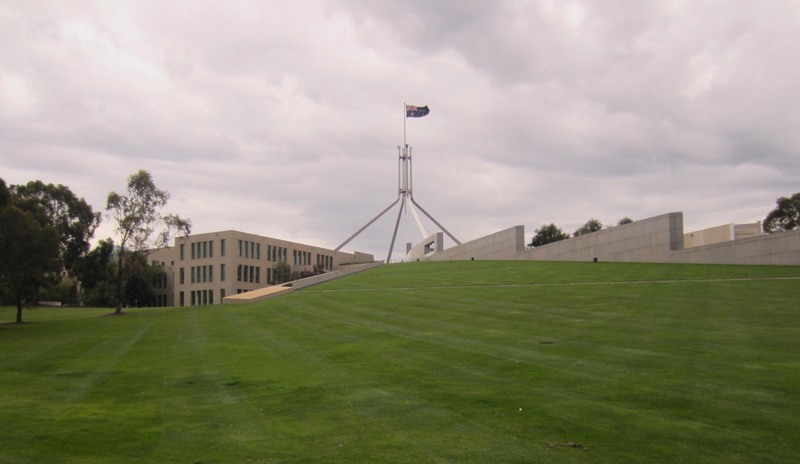 We pass Australia's federal parliament building, half hidden under a hill of grass. We were now within sight of the end-point. At two o’clock, exactly five hours after departure, we were back where we had started. We had covered 20.72 kilometres. So over two days we had walked 42 kilometres. I savoured the figures in my mind’s eye. I liked the sound of them. Forty-two. According to Douglas Adams in The Hitch Hikers Guide to the Galaxy, 42 is the answer to the ultimate question of life, the universe and everything. At that moment I reckoned he was right. Emmy and I posed triumphantly for photos: two tough and very stringy old turkeys. The day ended with a presentation ceremony. 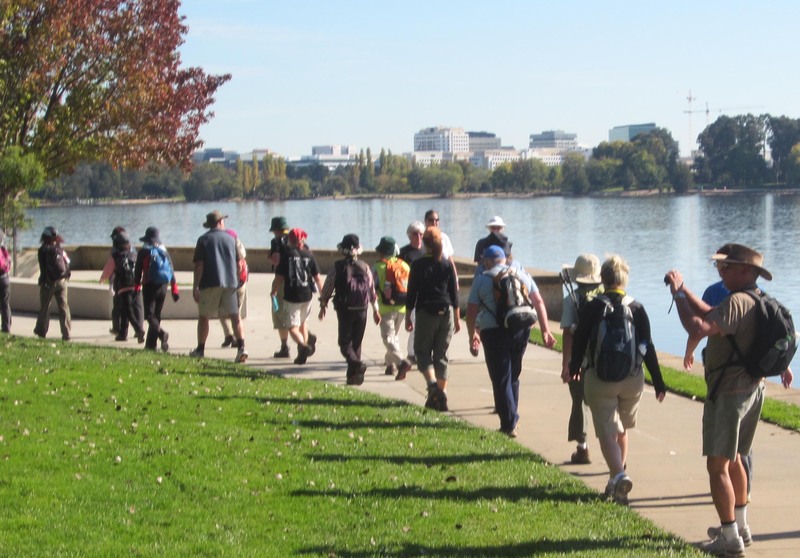 I got a silver medal for having completed five annual Canberra walks. Proudly I stepped up to the podium, lowered my head to have the medal slung around my neck, and nodded in blasé acknowledgement of the audience’s applause. As I did so I made the mistake of glancing behind me. A queue of other walkers was lining up to receive their medals too, walkers who had completed ten annual walks, and fifteen, and twenty. And one international walker who had completed two-day walks in 21 different countries. Hmmmm…. you’ve got a long way to go, Quinn. Still… I fingered my silver medal and felt pleased. 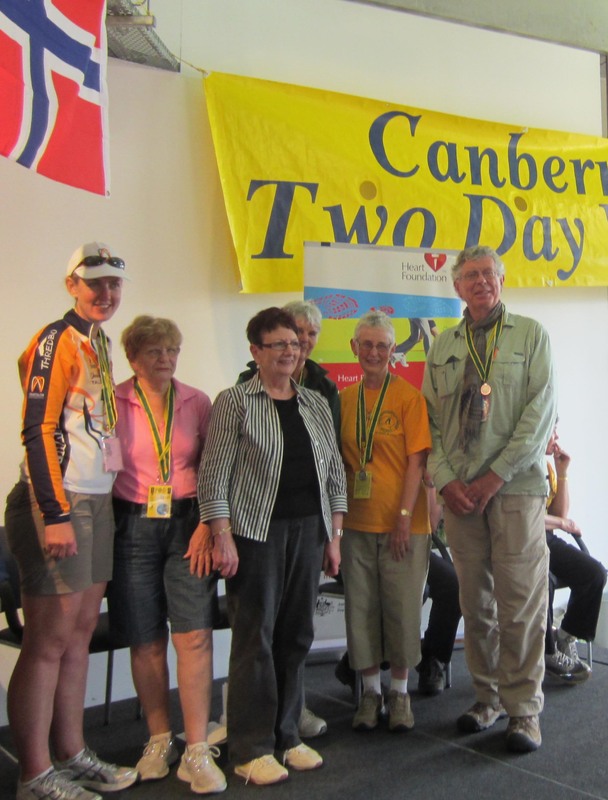 I pose on the podium with other walkers who have won a silver medal for completing 40 kilometres on each of five annual Canberra Walking Weekends. In the centre, local parliamentarian Mary Porter who presented the medals. Saturday March 31st 2012 brightened slowly in Canberra under an eggshell blue sky fading to a peach haze that edged the hills to the south. Ragged flights of cockatoos charged screeching through the still air. Dew lay like frost on the warm grass. The first gold of autumn was burnishing the city’s trees. As you can see, my literary rhetoric engine was turbo-charged and I was looking forward to two perfect days of walking. 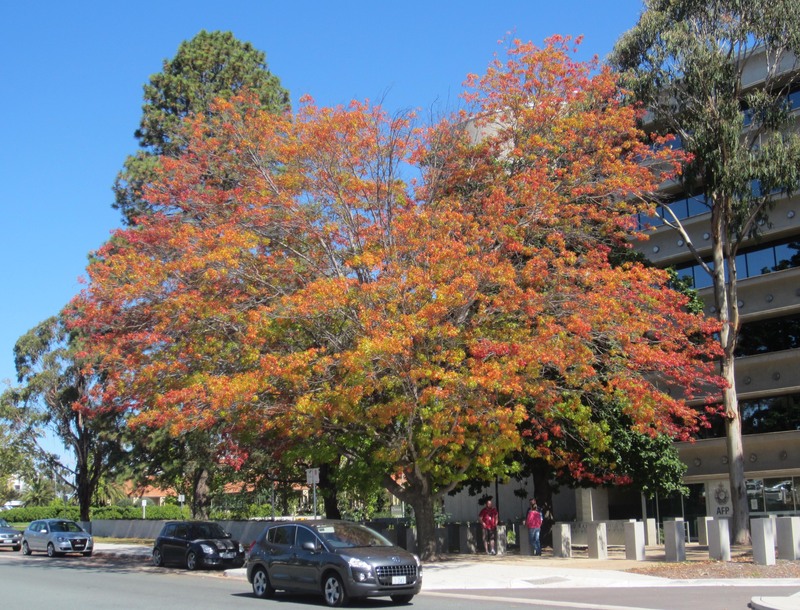 Across the street from the Walk control centre autumn is already painting its colours on this tree. For some mysterious but very apt reason, the control centre and beginning point for the walk was located in a branch building of Charles Sturt University’s Faculty of Theology, about one kilometre from Parliament House near the centre of Canberra (see Google Earth location at: 35°18’14.02″S, 149° 8’12.83″E). 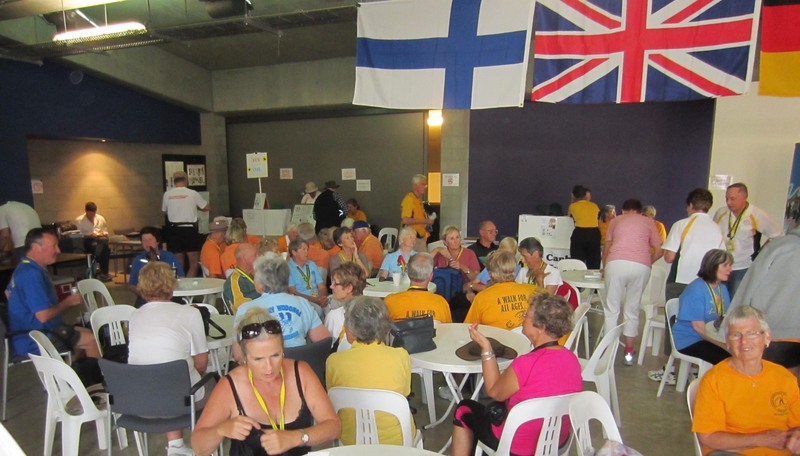 At 8.30 a.m. Emmy and I had registered at the check-in desk, and were lolling on plastic chairs among other walkers in the flag festooned centre, enjoying the quiet, unhurried, well-organised prelude to the day’s challenge. There were four categories of walk, each starting at a different time. The real fanatics left early in the morning on a marathon-length walk. They were followed by the 20-kilometre walkers, then the 10 kilometre walkers and finally, late in the morning, by a small cohort of courageous elderly walkers tottering over a five kilometre route. 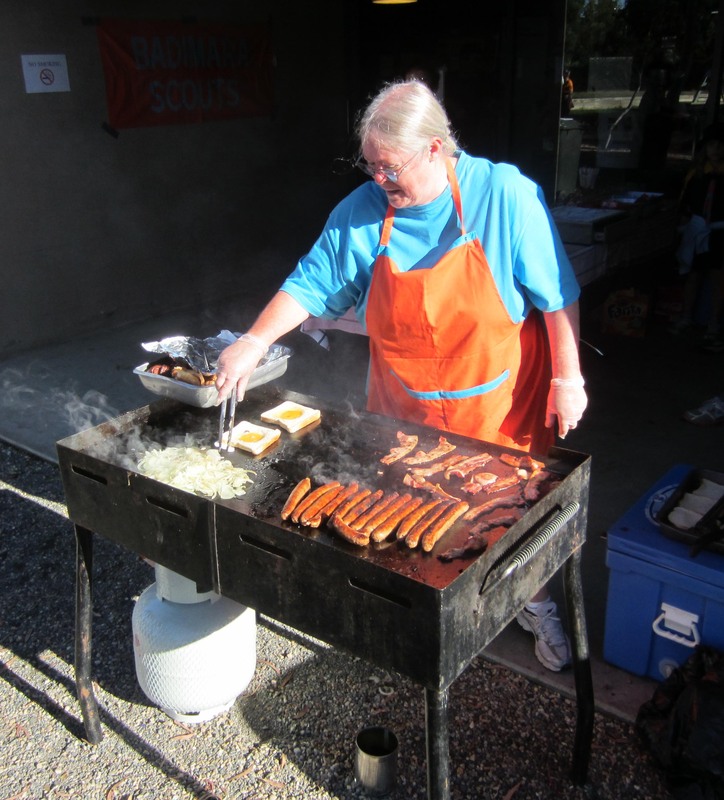 A breakfast barbecue provides a hit of calories to carry walkers through the day. About 100 walkers, including Emmy and me, left the control centre at 9.00 am on the 20 kilometre walk. The route would take us north across the main bridge over Lake Burley Griffin that leads to the centre of the city, then west along part of the north shore of the lake and into the campus of the Australian National University. 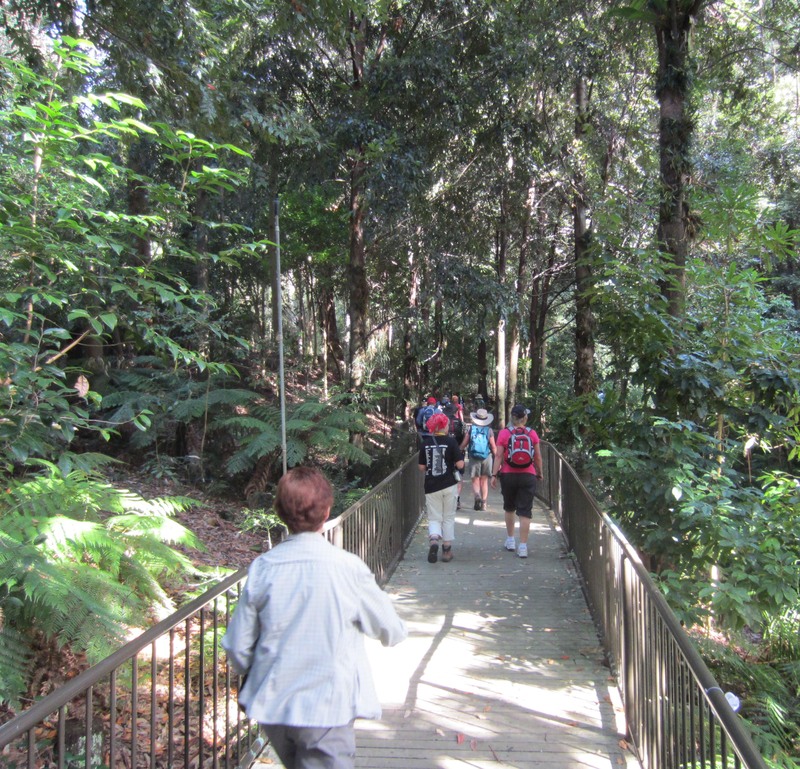 The route then veered into Australia’s National Botanic Gardens (see Google Earth location at: 35°16’32.37″S, 149° 6’31.43″E) at the foot of the city’s main natural landmark, Black Mountain. Walking through a stand of rain forest in the National Botanic Gardens. The track dipped into the gloomy environs of a small rain forest. A boardwalk snaked among tall ferns and tropical trees. Then, skirting lawns and dry-country eucalypts, it bent upwards and curved around the slopes of the mountain. 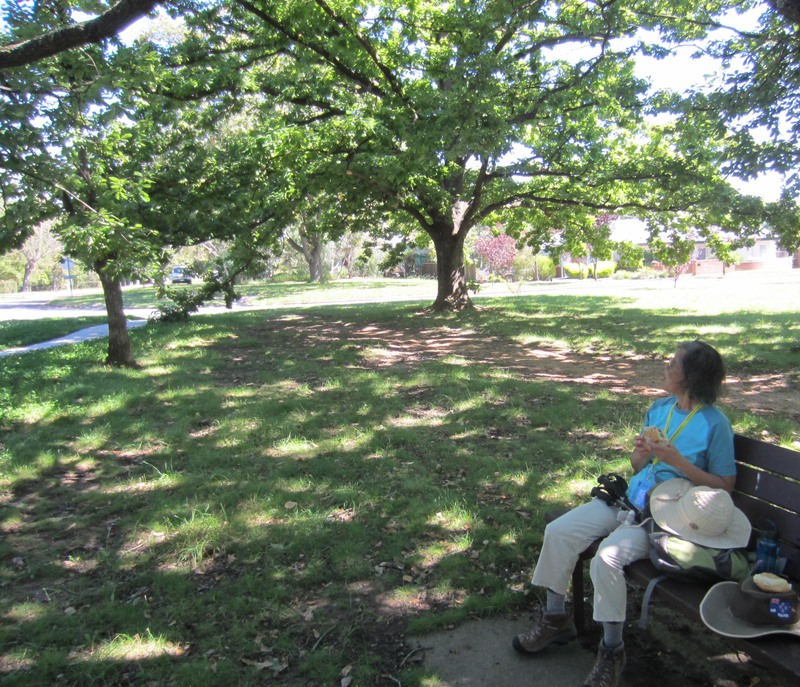 We emerged into the inner suburbs of north Canberra. 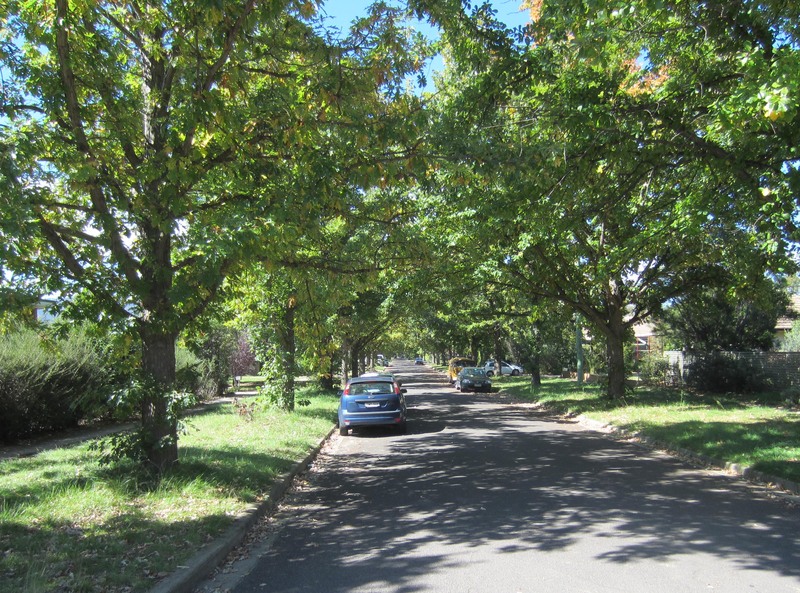 These are among the “old” parts of Canberra, but they were mostly built as recently as the 1950s and 1960s. At the O’Connor shopping centre we had our walker’s cards punched by walk monitors and – under Emmy’s disapproving frown – I popped into a supermarket for a bottle of Coke. 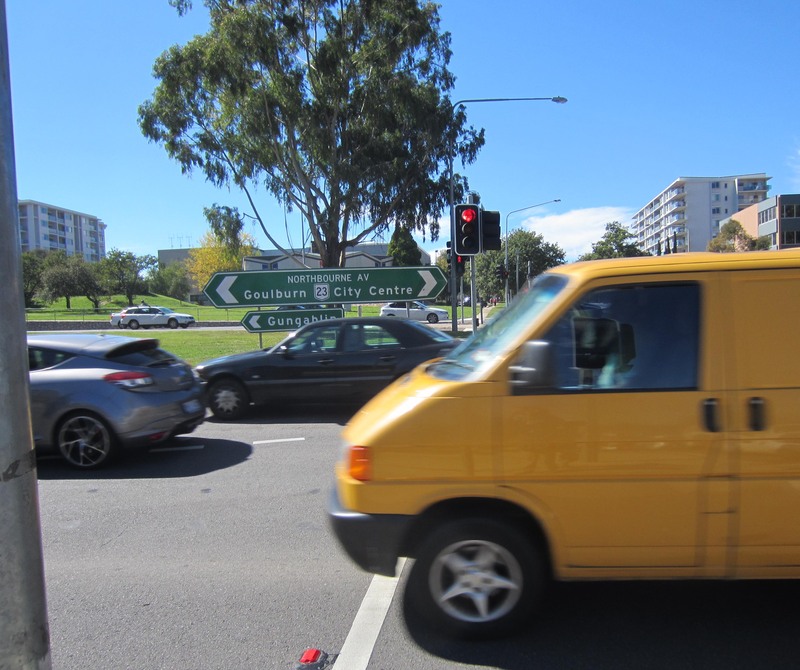 ... and across Northbourne Avenue, the city's main thoroughfare. Circling through the suburb of Lyneham we passed pavement coffee shops with drowsy customers drooping over coffee, croissants and newspapers in the warm Saturday sun. It was too much for some walkers. They drew up chairs and ordered a caffeine fix. 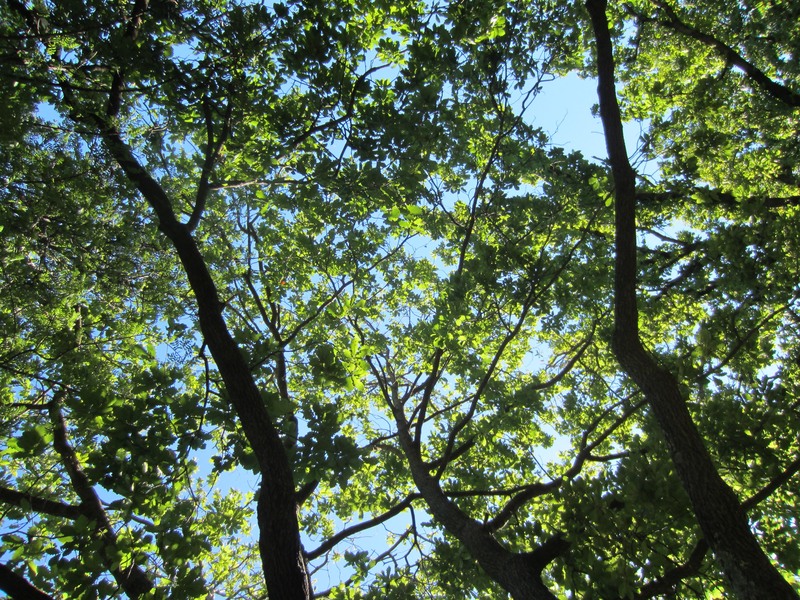 ... shaded from the sun under a latticework of leaves. But Emmy and I pressed on. 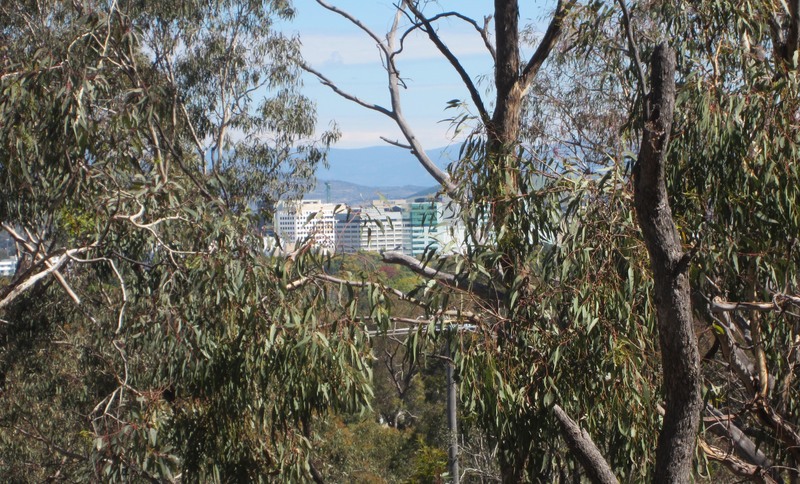 We crossed the traffic-crowded main artery of Canberra – Northbourne Avenue – and headed towards the city’s highest peak, Mount Ainslie (843 metres). Luckily we didn’t have to climb it. Our route took us around the base of the hill to the National War Memorial. This stands at one end of Anzac Parade, a broad avenue that leads south-west down to Lake Burley Griffin, carrying the gaze over the lake, past old Paliament House, and up to the new Parliament House (opened 1988). ... and through grey-green gum trees we glimpse the centre of the city. 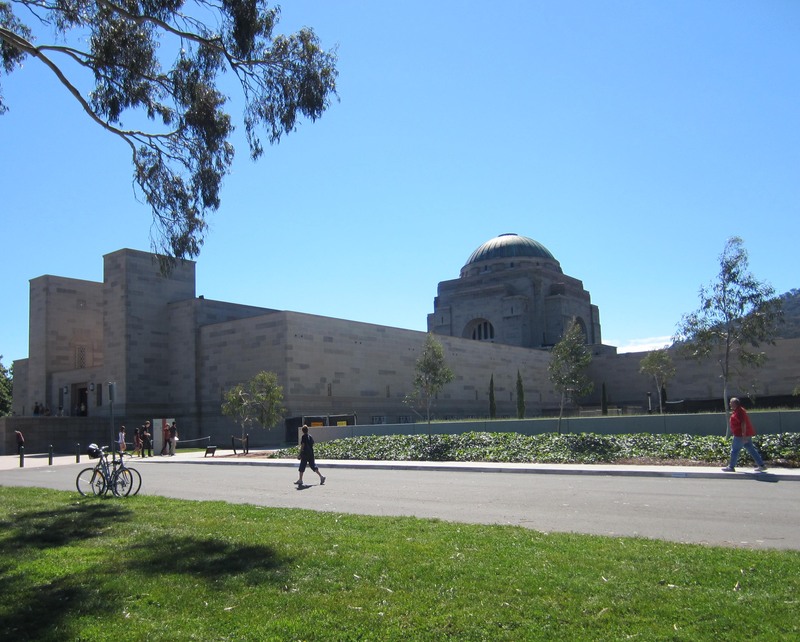 Anzac Avenue is lined with war memorial monuments. For me the most poignant of these is the very first, at the north end of the avenue. 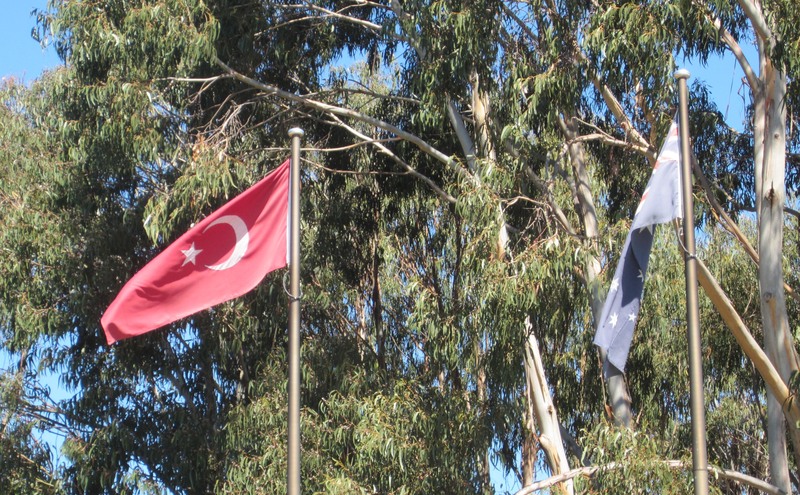 Here the flags of Turkey and Australia fly side-by-side over a simple arrangement of four columns flanking a semi-circular wall. (see Google Earth image at: 35°16’58.40″S, 149° 8’52.55″E). In April 1915, Australian troops – together with New Zealand, British, French and Canadian forces – attempted an invasion of Turkey along the Dardanelles Peninsula. After eight months of fierce Turkish resistance the allied armies were thrown back. More than 80,000 Turkish soldiers died. Allied casualties numbered around 44,000, including over 8,500 Australians and 2,721 New Zealanders, about a quarter of those who had landed on the peninsula. Australia's National War Memorial in profile. The savagery of the fighting has not been forgotten, but today it forms the basis for an edifice of myth-making that romanticises the relationship between the ANZAC forces and their Muslim adversaries in Turkey. The ruthless shredding of men, the squalid deaths from dysentery, the bottomless stupidity of politicians and generals, all have been transformed into warm acknowledgement of common Aussie-Turkish humanity in which religious differences play no part. And yet no lessons have been learned. Anti-Islamic paranoia is widespread in Australia and the institution of war continues to thrive. The governments of Australia and New Zealand still send their young men and women to be shredded in stupid wars not too far from Turkey. Who knows, maybe one day in the future our current “enemies” – Al-Qaeda, the Taliban, Shia militias – will also be lionised as noble companions in common suffering, their courage acknowledged in new monuments along ANZAC Parade. 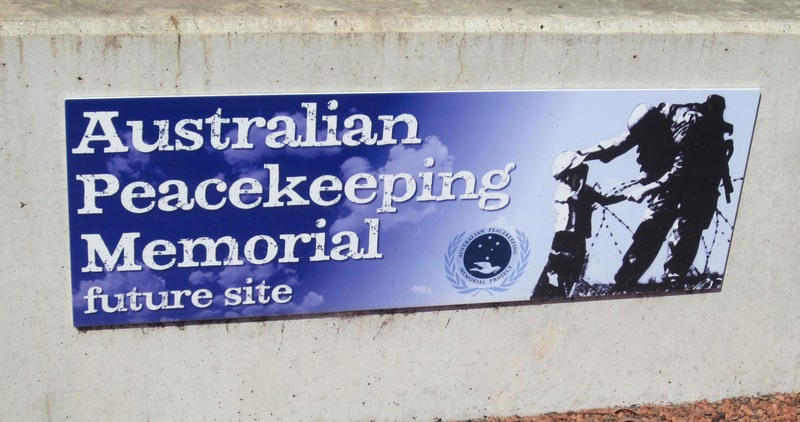 Meanwhile, a site on the avenue earmarked for a peacekeepers’ memorial remains vacant. Turkish and Australian flags fly side-by-side over a joint memorial recalling the Gallipoli campaign of 1915. 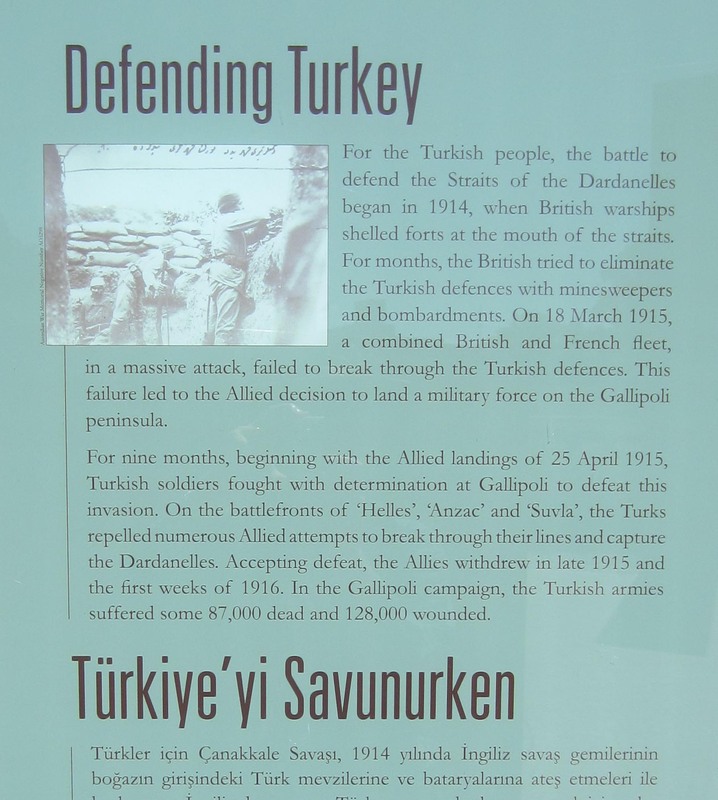 A bi-lingual plaque on the memorial commemorates the courageous Turkish defence of their homeland against an invasion force that included Australian and New Zealand troops (the ANZAC force). Will this memorial ever be built? With these thoughts troubling my mind we reached the north bank of Lake Burley Griffin, turned east, passed under the gently chiming bells of the National Carillon, and returned to the control centre almost exactly five hours after we had set out. My GPS thingy told me we had covered 21.35 kilometres. Spectacular tatooed face on a Maori carving, central Rotorua. Sunday, March 18th was warm, overcast and humid. There was a hint of rain in the air, but it never materialised. Our route on the second day of walking took us through the suburbs and parks of Rotorua city, along the shores of Lake Rotorua and through the city centre. As always, the unassuming demeanour of our walking companions hid stories that might fill a library. 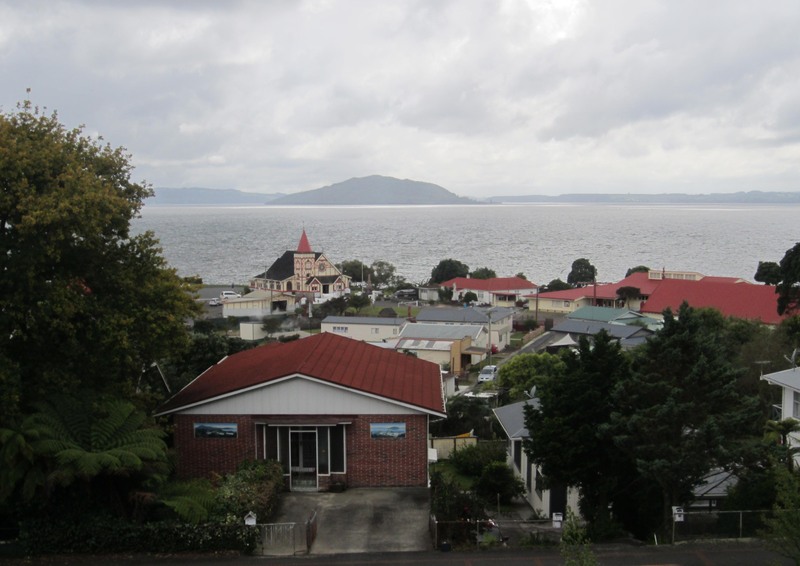 As the comfortable houses of suburban Rotorua slid past I fell in with a small feisty woman, well into her sixties. She had a remarkable story to tell. Born in Amsterdam she had worked for a time in England where she met her husband, a polynesian from the island of Rotuma in the Fijian archipelago. They married and migrated to New Zealand where they ran a small convenience store in a hospital in the Bay of Plenty region. The business was a great success. Part of Rotorua township and Lake Rotorua. The picture was taken looking north-east from: 38° 7'45.73"S, 176°14'47.33"E. Check the site on Google Earth. One day she asked her husband to steady a chair she was standing on while she reached for something on a high shelf in the shop. Somehow her husband’s foot got pinched under a leg of the chair while she was standing on it. He didn’t cry out and the incident lasted no more than a few moments. But its consequences were devastating. Her husband was a stoic gentleman, she told me. He thought the pain in his foot would be momentary, but it persisted, though he never complained. Months later the pain had become unbearable and he had his foot x-rayed. A bone was broken. It had become infected and had “gone all black” (probably it was gangrenous). Like many polynesians, her husband was “large” and he had developed diabetes. The circulation in his leg was not good, the problem worsened and medication didn’t solve it. Eventually the leg had to be amputated at the knee. He became immobile. The couple had to abandon their shop and the lady became a full-time carer for her husband. She managed to get him into a respite care centre for a couple of days a week, and, to help make ends meet, she worked as a cleaner at a tourist resort on those days. Her work required her to clean 54 bedrooms plus a dining room in one day. 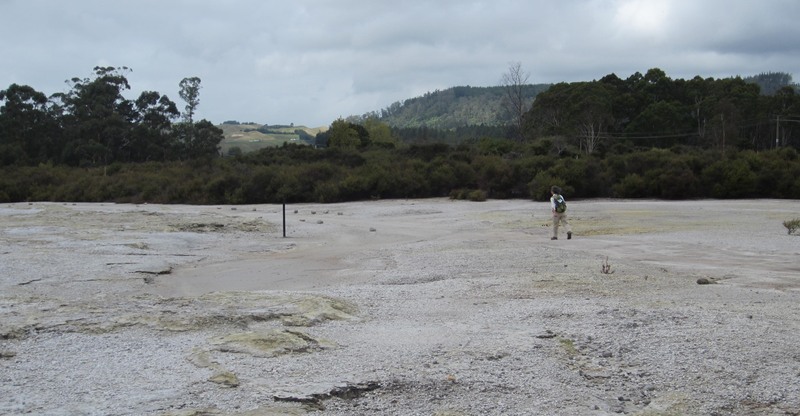 In the course of a year, Rotorua’s two-day walking weekend was her only opportunity to have a holiday. To participate in the walk she had persuaded her daughter to drive down from Auckland and take over caring duties for two days. That’s why she was walking with such a surprising spring in her step. 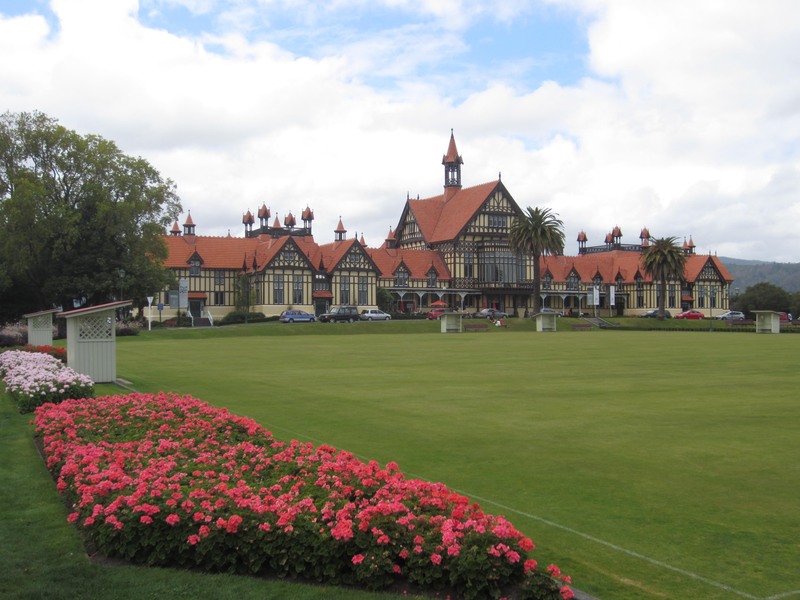 Formerly hot baths, now Rotorua's museum. The Maori people are fighting hard to keep their language and culture alive. 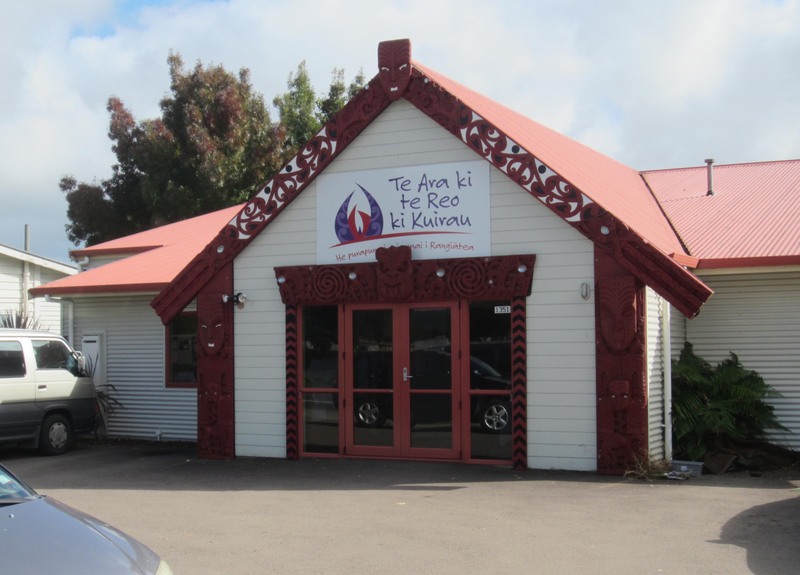 Our path took us past this Maori-language early childhood education centre. Rotorua’s thermal underground breaks the surface at many points in and around the city. Steam billows over some city parks (see for example Google Earth at: 38° 7’47.99″S, 176°14’39.22″E), there are pools filled with infusions of hot milky-green water, steam gurgles up from porridge-pots of hot mud. In some places fumes kill the vegetation, creating blasted mini-landscapes of grey and white (Google Earth: 38° 8’26.90″S, 176°15’35.91″E). Many houses tap into the heat beneath them for hot water and warmth in winter. 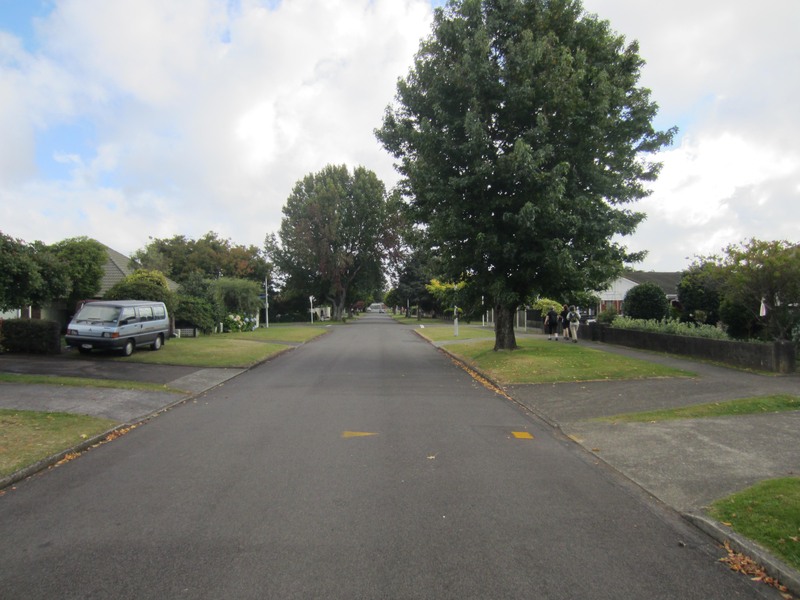 Our path on day two of the Walk took us through the quiet suburbs of Rotorua. 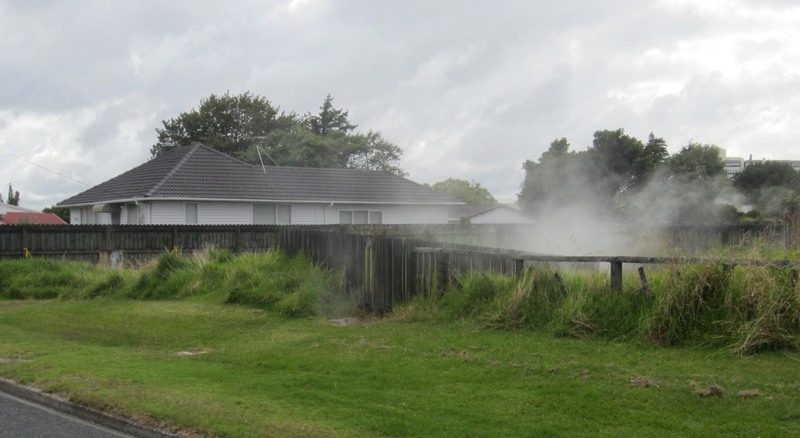 Steam rises from the ground right beside a suburban house. Many homes are heated with natural geothermal heat from the ground beneath them. The downside, of course, is the sulphuric smell. It was already wrinkling our noses on the highway as we drove towards the edge of town two days earlier. In Wellington, my brother had praised Rotorua’s aroma. Thoughtfully eyeing my grey hair and wrinkled face he told me that Rotorua was great place for the elderly. It had a caring community, a fantastic environment and excellent health care services. Tourists getting steamed in a public park near the centre of Rotorua. Emmy makes her way very carefully across a section of the track that passes over earth made lifeless by the effects of geothermal heat. Around 2.00 pm Emmy and I limped into the Control Centre and were handed a congratulatory lollipop. An informal closing ceremony followed. Mr Kim received a special IML award for his walking achievements across the world. There was a “lucky draw” of prizes from local businesses, one of them being free entry to a sheep shearing exhibition. And to close, we sang “Auld lang syne” and the beautiful Maori song “Now is the hour”, both to the accompaniment of a solo ocarina. It was all charmingly amateur but organised with warmth and efficiency. Somehow it left a small lump in my throat. Rotorua… we will be back. Steam-cleaned but not yet deodorised, we make it to the end point of the two day walk. 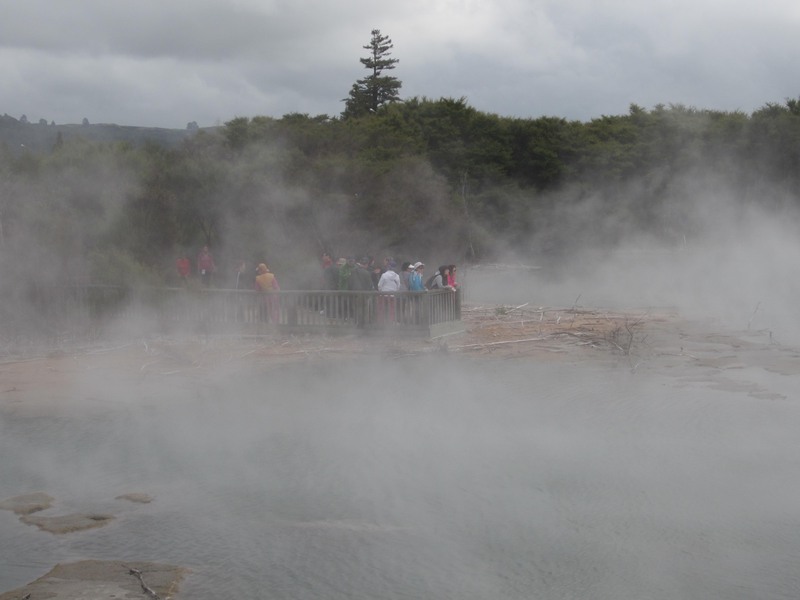 If there is one word that sums up Rotorua in New Zealand’s Bay of Plenty region it is “hospitable”. Sure, the town is a bit of a tourist trap, but in the nicest possible way. Its friendliness reaches out at once, its laid back style is disarming, its Maori culture and thermal environment are a unique and winning combination. The annual Rotorua Weekend of Walks is part of a week-long walking festival (see http://www.rotoruawalkingfestival.org.nz/ ). The weekend walks qualify for awards under the auspices of the International Marching League (IML) see www.imlwalking.org/. The IML offers walkers medals for completing its walks in 26 different countries across the globe. Walkers are required to complete at least 20 kilometres on each day of a two-day event, and this achievement is recorded in an IML “passport”. 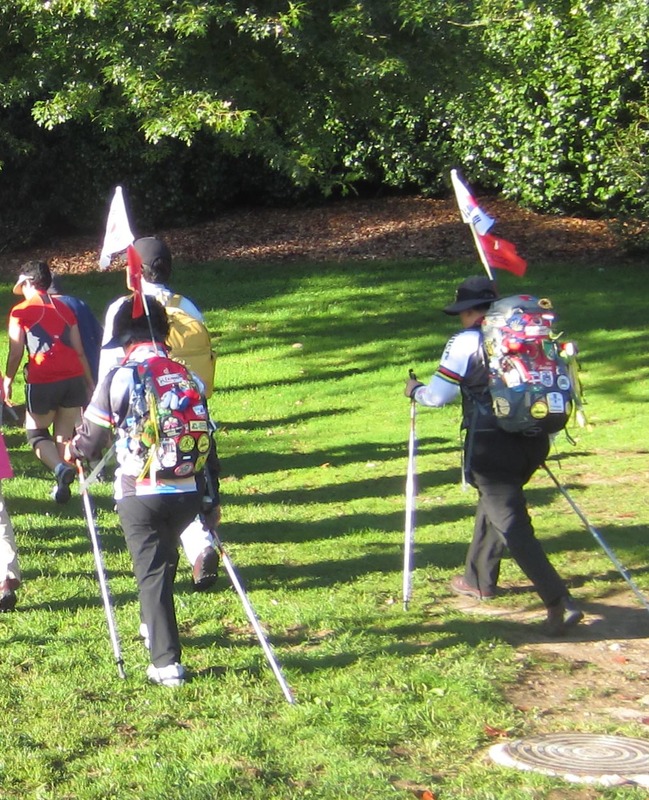 Rotorua’s two-day walk is also affiliated with the Internationaler Volkssportverband (IVV) see www.ivv-web.org/english/. In the early evening of Friday, March 16th Emmy and I arrived at the Walking Festival headquarters in Rotorua’s Neill Hunt Park for an appetiser: a one-hour guided excursion at night into nearby Whakarewarewa Forest on Rotorua’s outskirts (check the location on Google Earth at: 38° 9’17.81″S, 176°16’50.70″E). This turned out to be a memorable event, in fact the cliché “magical” is almost appropriate. It was memorable for the deliciously spooky experience of walking in pitch darkness along narrow dirt paths illuminated only by flashes of torchlight and glimpses of the moon sailing among black trees in a starlit sky. The haunting calls of New Zealand’s ruru native owl kept us company. Glow worms gleamed under pathside bushes and we looked up into dark green fans of mamaku ferns far above us. Our guide – a professional ecologist – provided interesting and occasionally disturbing commentary. (Sorry, I’ve forgotten his name… but he was top value.) For example, he told us that New Zealand’s 2,500 species of native plants were matched by 2,500 species of introduced plants. There was now almost no place in the country where original vegetation could be seen untainted by invasive species. 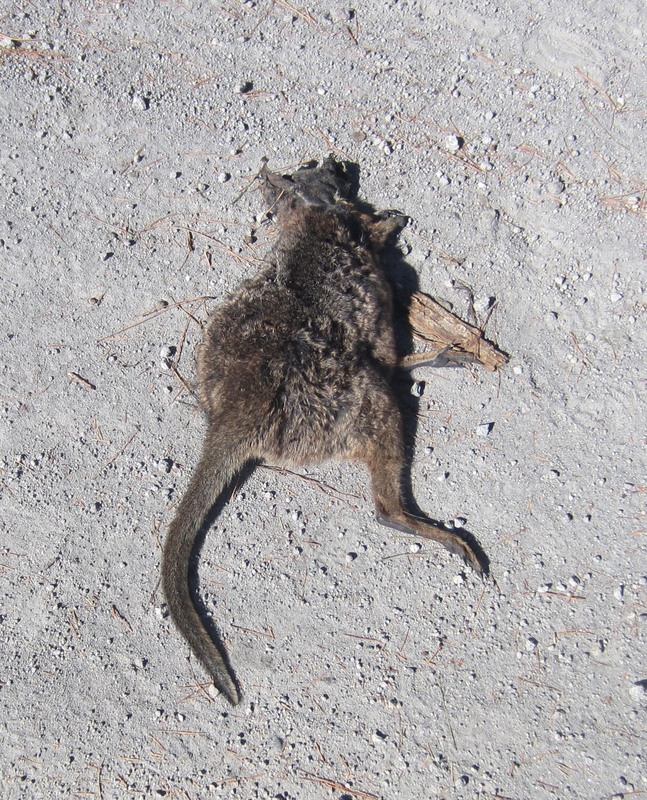 Some 60 million Australian possums were devastating the environment and nothing much could be done about it. 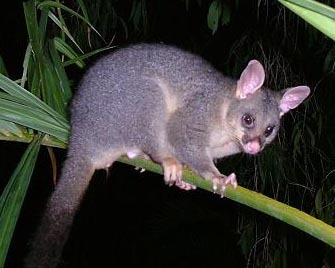 Biological controls (like the species-specific calicivirus disease that has dramatically reduced rabbit numbers) could not be developed for possums because of the danger that it would spread to Australia and devastate possum populations in their native habitat. Right on cue, our guide’s flashlight picked up a possum clinging to the trunk of a nearby tree. The size of a cat, but with a bushy tail and a pink, pointed snout, it calmly looked down at us, its eyes bright with curiosity. 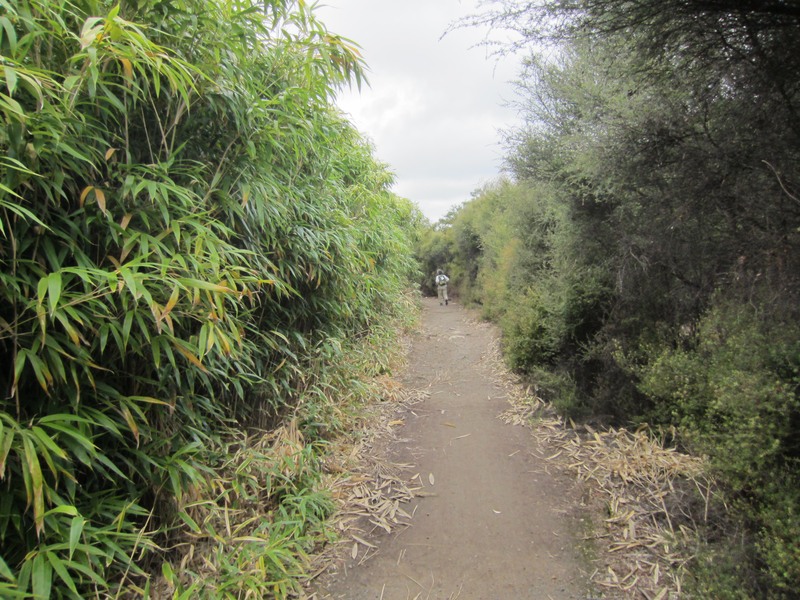 We walk along the border between an aggressive invasive species (bamboo) on the left, and a native species (tea tree) on the right. 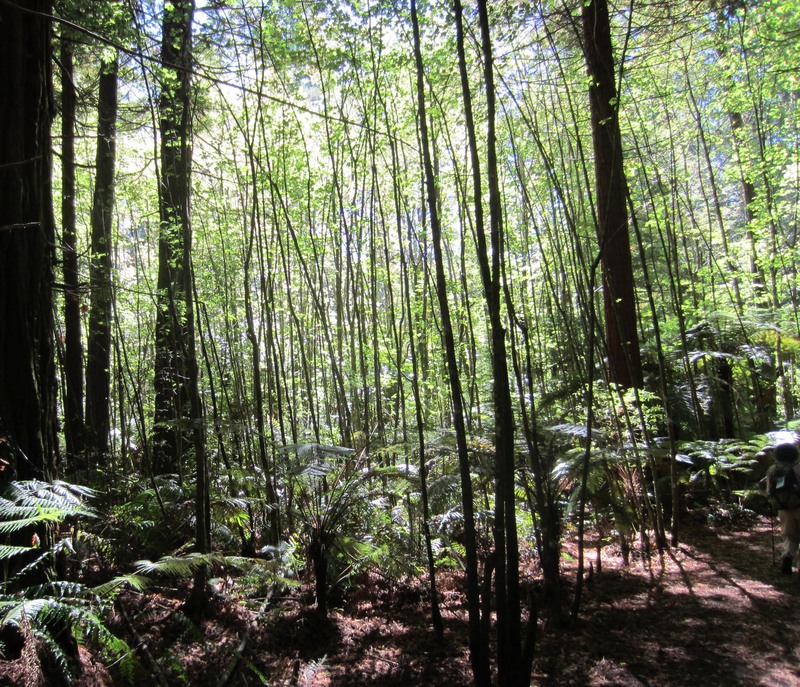 The following day we saw the Whakarewarewa forest in bright sunshine. The walk took us on a meandering path twenty kilometres through its various sections. Much of it is a working commercial forest producing radiata pine logs for sawn boards and paper chips. 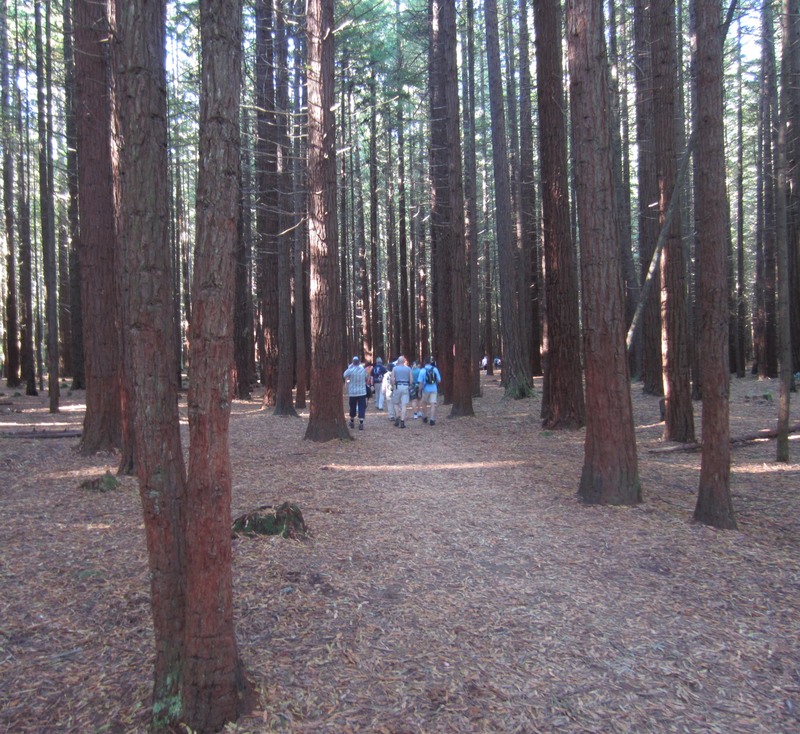 There is also an extensive and beautiful plantation of tall California redwood trees. The forest lies over a geothermal area with thermal pools and plumes of steam rising here and there. It is popular with mountain-bike riders who crunch the gravel paths at high speed, no doubt getting an exhilarating lift from the wind in their faces but missing the forest’s bird calls. We are dwarfed by "young" north American redwood trees. A plume of steam rises from a hot pool in Whakarewarewa forest. It's not just possums that are a problem for the environment of New Zealand. Australian wallabies are getting in on the act too. We came across this dead one on a forest path. Mr and Mrs Kim, proud Korean patriots. Ahead of us I saw the unmistakable figures of Mr and Mrs Kim from Korea. 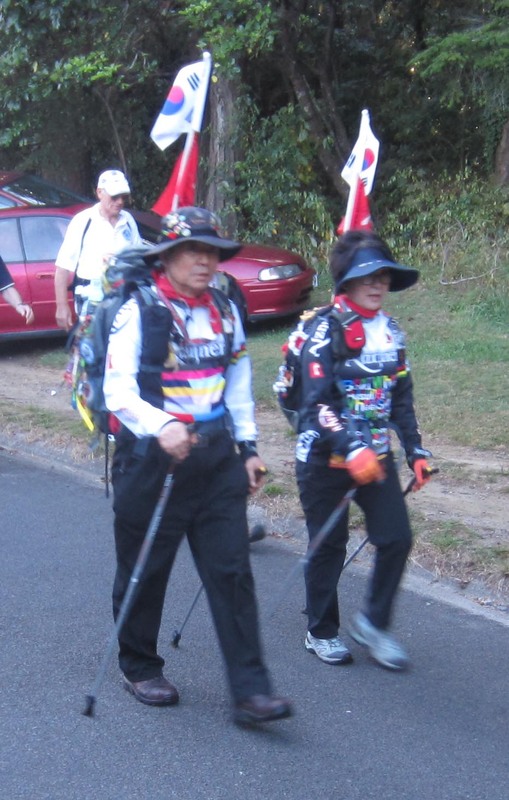 They walked under the flag of their country and the flag of Mr Kim’s company (he supplies tailor-made inner soles that correct problems in the gait of walkers). Crammed on their backpacks were colourful badges and patches gathered from walks all over the world. They propelled themselves forward with nordic walking poles, taking care to wield them in the technically correct fashion. Less spectacularly clad, but no less memorable, was the Dutch-New Zealand ocarina player. He piped us on to the track with “When the saints going marching in” and pushed us along with “Tulips from Amsterdam” and many other tunes. 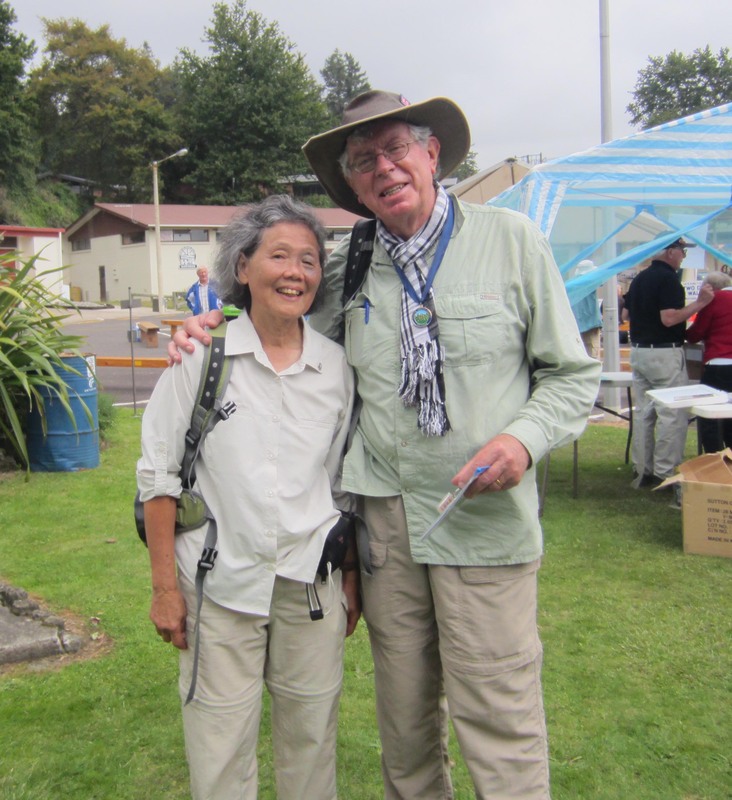 Mr and Mrs Kim, the most "professional" of the walkers on the Rotorua two-day walk. 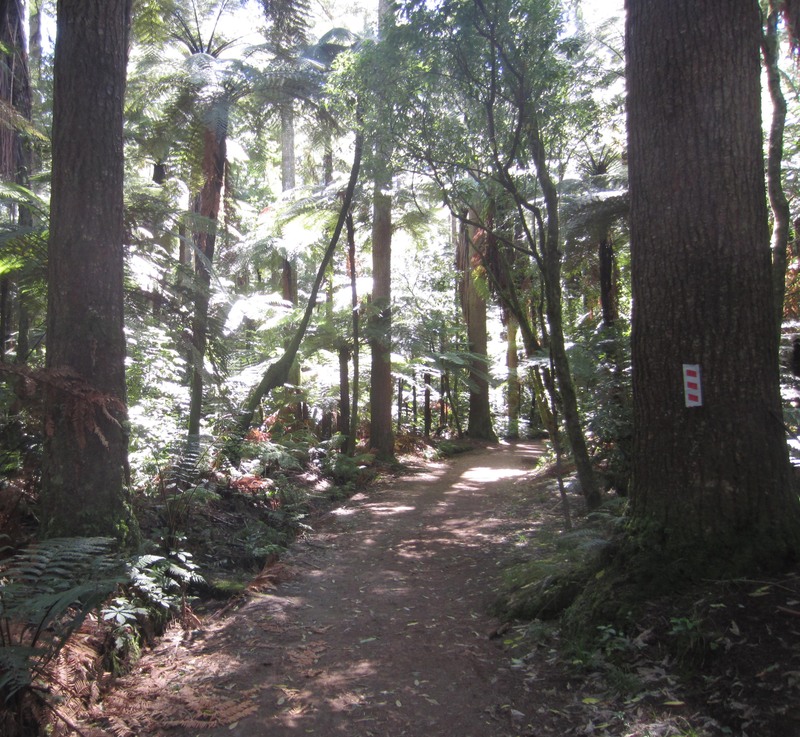 An ocarina virtuoso helps us conquer the Whakarewarewa track. 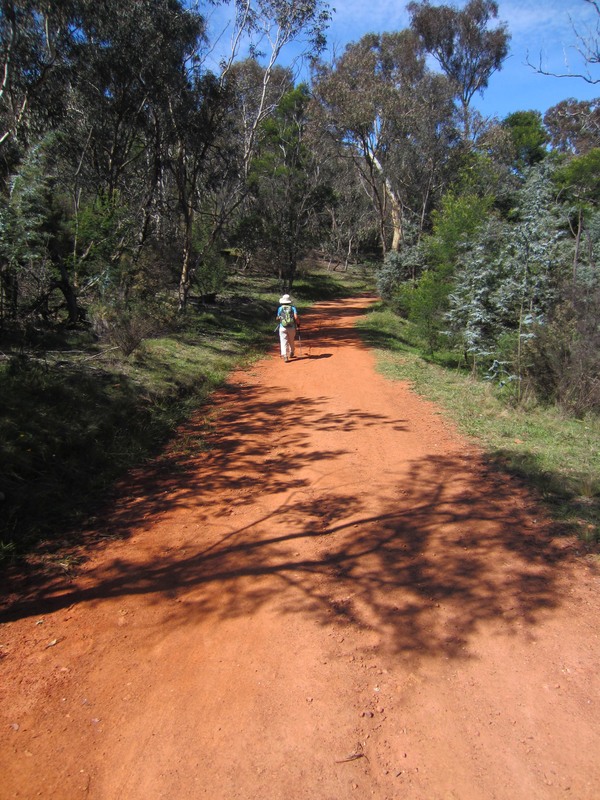 It was our ocarina virtuoso who also piped us into the Walk Centre after four and a half hours and twenty kilometres of bushland beauty. The warmth of the day had sapped our strength and we gratefully bit into the freshly picked, very juicy apples that local volunteers (some of them children) handed to walkers as they checked in. Afternoon light amid the trees of Whakarewarewa forest. Bird song greets the sunlight as it filters into the forest.. 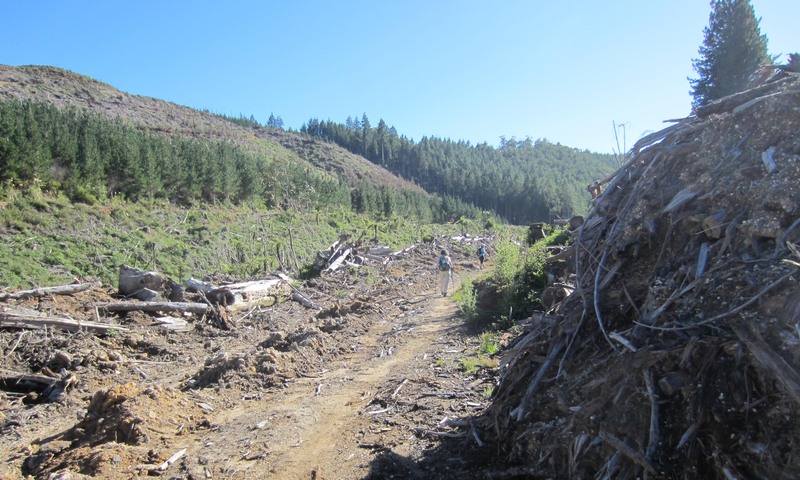 But Whakarewarewa is a "working forest" and this is the fate that awaits part of its wild beauty.